Greyhound racing has a long tradition in Sarasota, but it’s coming to the end of the line. It’s 9 o’clock on a recent Friday night at the Sarasota Kennel Club and two dozen men stare in silence at two walls with a dozen TVs each. Each screen simulcasts a different track from around the country: dog races in Palm Beach and St. Petersburg, horse races in Buffalo. The volume is turned off on every TV. It’s so quiet I can hear the bettors shuffle their betting slips and someone chewing ice. When one bettor clears his throat, it echoes throughout. The greyhounds started racing last month and it looks like it will be their last season. 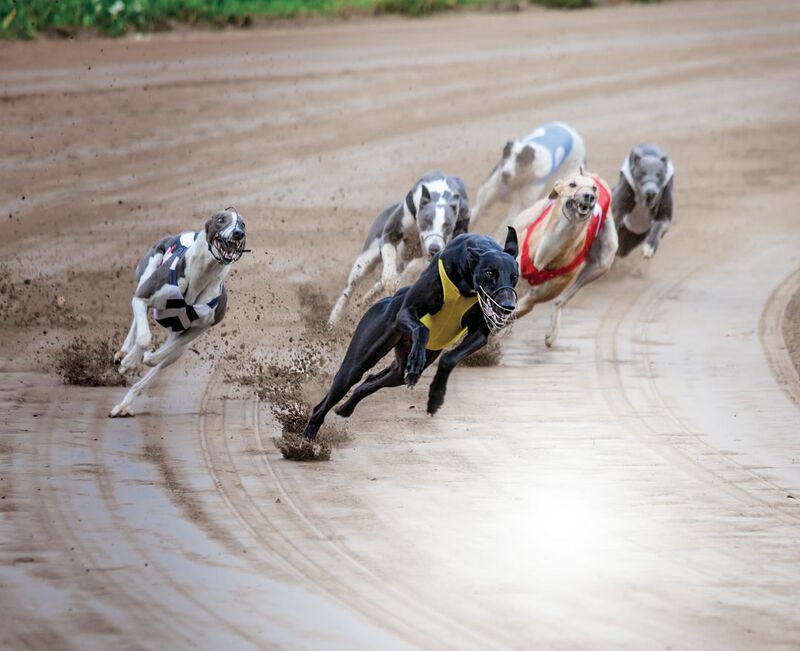 Sixty-nine percent of Florida citizens voted to ban dog racing in November, giving the Sarasota Kennel Club and the other dog tracks in the state until Jan. 1, 2021, before they need to shut down. Owner Jack Collins Jr., 55, says the Sarasota Kennel Club will close for good May 4, 2019. “The people made their choice, and we have to deal with it,” Collins says. He thinks voters were misled into thinking that the dogs weren’t well treated or maintained. “Obviously there were incidents, but more accidents happen in horse racing,” he says. Collins isn’t worried about the financial costs of losing the track since the business—like all dog tracks across the state—makes most of its money on the card room, not the greyhound races. The future will be simulcasts and cards. “It’s just that it was a family-run business for 75 years; it was a tradition,” he says. What will happen to the 32-acre property? Collins might redevelop it, relocate the card room or rent. He’ll have to cut staff. He employs 300 people during live racing season. He expects to have two-thirds fewer employees once the dogs are gone. The kennel club has about 50 betting stations, but only four tellers are working the night I visit. I want to place a bet, and I’ve never done it before, so the teller helps me, giving me an 8-sided die. I roll an 8. “Which track?” she asks. The only track I can remember is Palm Beach. My dog’s name is Gogo Pancake. I hand her $6 and ask her about the overall mood since the vote. 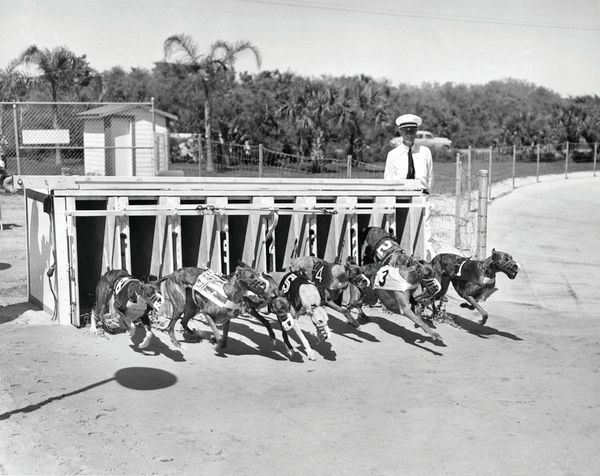 Dog racing at the Sarasota Kennel Club dates back to the 1940s. There are 17 dog tracks in the country. Eleven of them are in Florida. Many of the dogs will move up North, but there’s only so much demand. Dog racing has been on a steady decline for the past decade because of changing tastes and concerns about reported abuse of greyhounds. Depending on whom you ask, somewhere between 5,000 and 8,000 dogs race in Florida. Racing advocates worry that there won’t be enough time to find the dogs homes once the ban takes place, and the displaced dogs could be euthanized. Grey2k USA Worldwide, a lobbying organization dedicated to ending dog racing, believes that two years is more than enough time to save the dogs. Still, if tracks—like the Sarasota Kennel Club—end up closing earlier, that might not be the case. A middle-aged man wearing a black line cook uniform comes up to make a bet at the same window. He tells me his name is Billy Bob Joe, even though I can read his name on his work uniform. He’s been betting here for 30 years, and he and the teller know each other well. I ask him how he feels. “Greyhounds are bred to run,” he says. “What are you going to do with them now?” He tells me he’s developed a betting system so successful, he doesn’t even look at the dogs when he bets. The results of my race come in. “You won!” the teller exclaims. My dog places third, and she hands me $3.20. I tell her I am still out $2.80. “Do you want your $3.20?” she asks. I stuff the money in my pocket and decide I’ve technically won on my first—and last—bet on the dogs.